Two years ago, the sustainability business community elected me to the Global Reporting Initiative (GRI) Stakeholder Council (SC). Thank you, it has been an honor to represent you. I recently traveled to Amsterdam to attend the Annual General Meeting (AGM) of the Council. I thought our readers might like to hear some of what we discussed and learned. One caveat. There were parts of our discussion that are (and should be) confidential. The SC is tasked with advising GRI’s Board on its strategy. We also select/elect some of GRI’s Board members. Furthermore, these represent my individual views as a GRI SC member, but I am not an official spokesperson and don’t speak on behalf of the Stakeholder Council or of the GRI. These remarks have been reviewed by SC’s GRI liaison to be sure I’m not revealing information I shouldn’t. Virtually everyone who is involved in sustainability reporting is aware of GRI’s contribution to our field. It is the best known and the most respected approach to reporting—and has been for many years. We have shown that companies who use the GRI method for organizing their reporting receive better sustainability ratings. The table below shows a recent analysis across 4,000 companies. As you can see, companies that report using the GRI approach have consistently higher ratings on CSRHub than those who don’t. 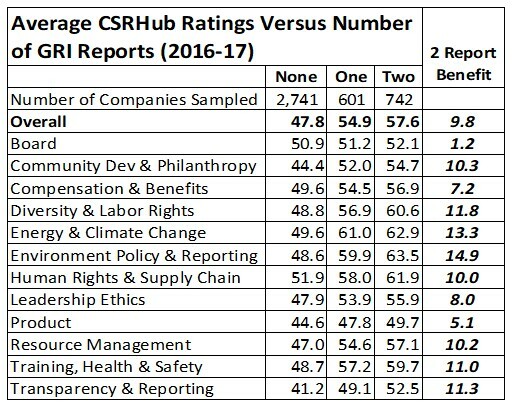 Since CSRHub’s scores include input from 565 different rating sources, there is a strong correlation between using GRI’s methods and how positively a company is seen across a wide range of different rating methodologies. Note that reporting only every other year is associated with less improvement. One of the things we discussed at the SC meeting was that some companies seemed to be skipping years in their reports. Our ratings data indicates that those who report every year seem to have a ratings advantage over those who don’t. One of GRI’s focus areas has been the harmonization of different ratings systems. This is in response to a perceived fractured reporting landscape and concerns from stakeholders (especially in the investment community) for simplicity and comparability in ratings. The chart below shows an example of the disconnect those using ratings must cope with. The six companies above are all large and well-studied. The consensus view of (as measured by CSRHub) is that their sustainability performance is pretty similar. However, the four ESG rating systems (and credit score) that we show above show a lot of variation. Even highly experienced users of these data sets are often at a loss to explain these differences. One of GRI’s responses to these concerns has been to participate in the Corporate Reporting Dialog. “The Dialog,” as it is known, is supported by seven ratings and standards-setting groups, including CDP, SASB, and Integrated Reporting. GRI would like to become the “IFRS of ESG.” Take a look at the International Financial Reporting Standards (IFRS) site, if you haven’t before (they are also a supporter of the Dialog) and you will see where GRI is heading. GRI is working on a number of new Standards. These will be released through the Global Sustainability Standard Board (GSSB) process. There is a hope that more Standards can be released over the next year, than over the past. GRI has built up its staff in the area and they are clear on their priorities. Expect a continuation of the working sessions in 2019 for GRI Community members (formerly known as the GRI GOLD community). There will be several meetings on corporate reporting, on integrating the UN Sustainable Development Goals (SDGs) into reporting, and on how best to organize digital reporting. Please feel free to send me comments, suggestions, and advice that may help GRI continue to be successful. I have one more year in my current term and would like to serve you, my constituents, well.